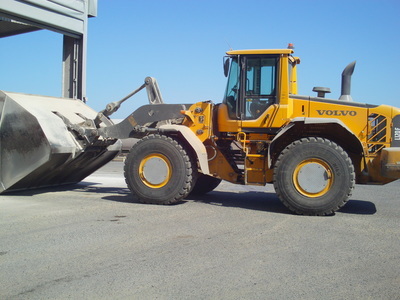 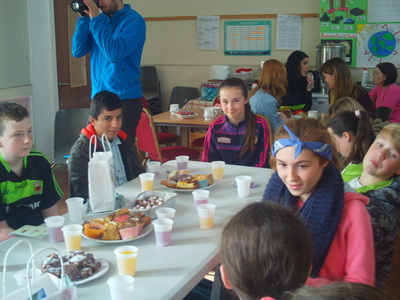 Is rang gnothach é. Bíonn a lán rudaí ar siúl ar nós na h-ábhair éagsúla, tionscnaimh, dramaíocht agus cluichí. 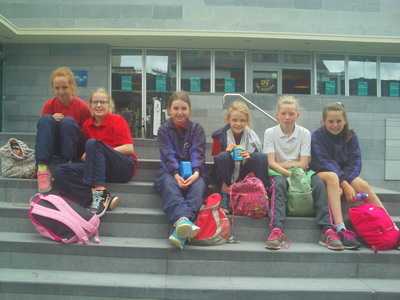 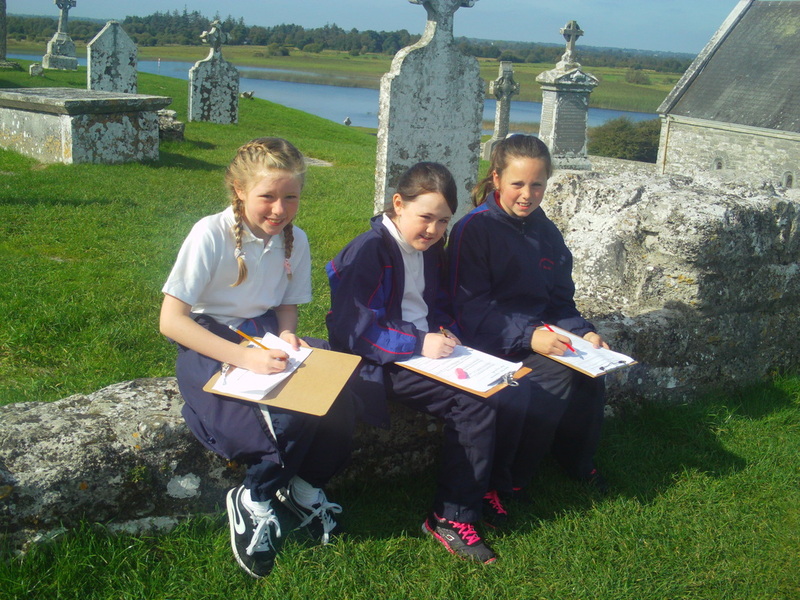 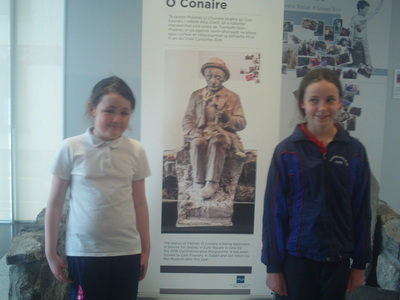 We went on a history trail to Clonmacnoise. 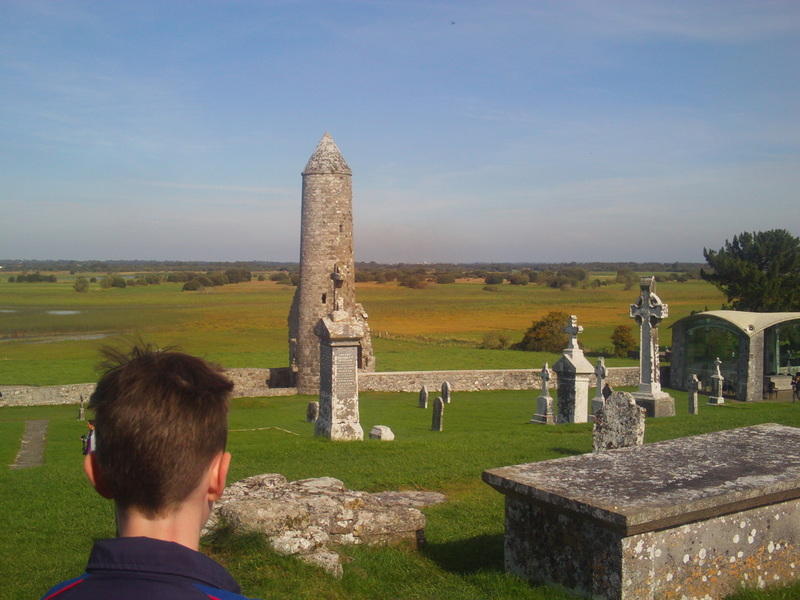 It is a very historical site with many ruins and artefacts. 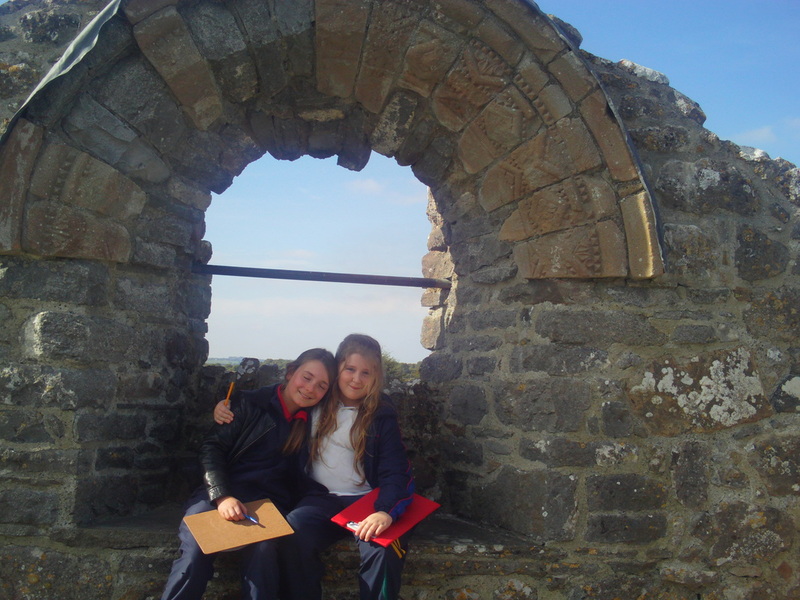 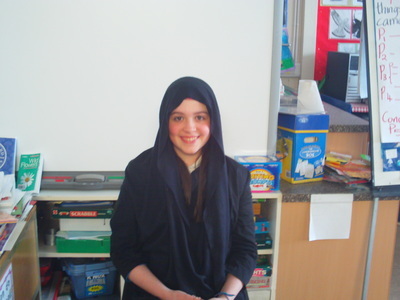 We learned that St Ciarán founded this monastery. There are beautiful high crosses on display. 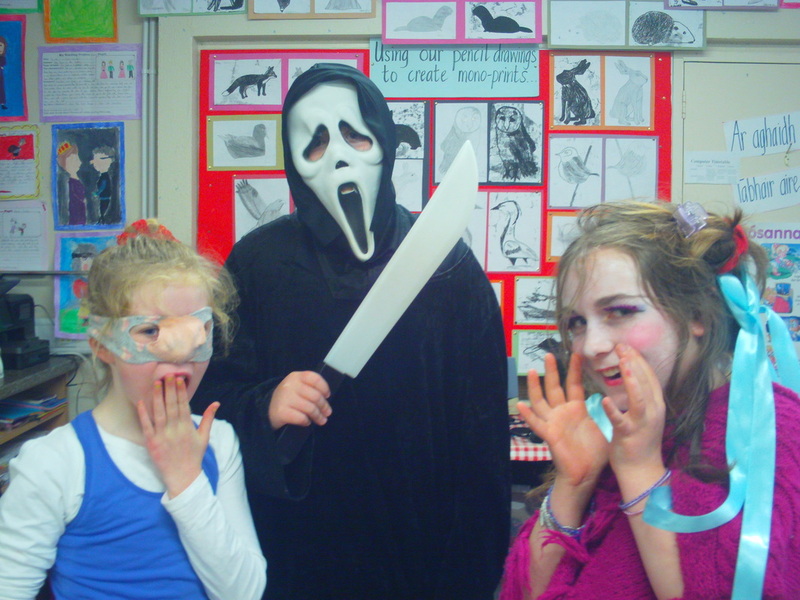 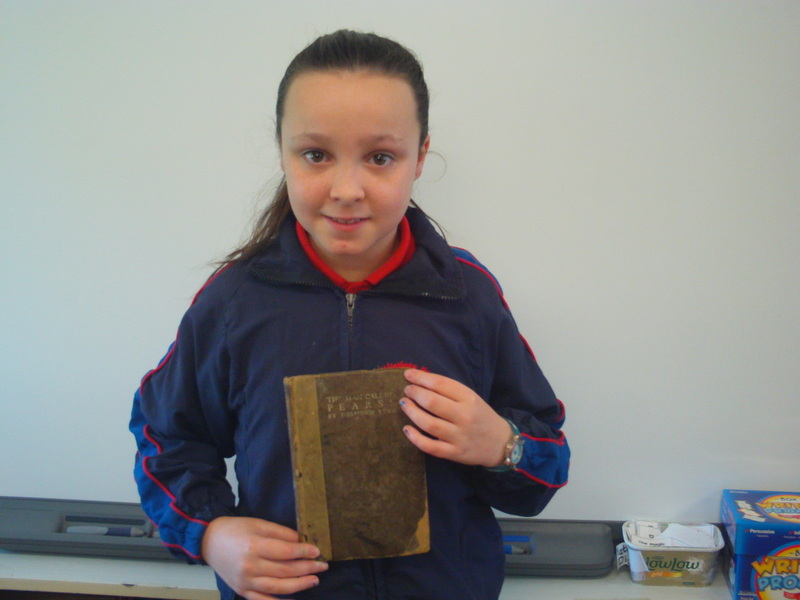 We discovered lots of interesting things and recorded information for our class project. There are lots of folklore & cures associated with Clonmacnoise. 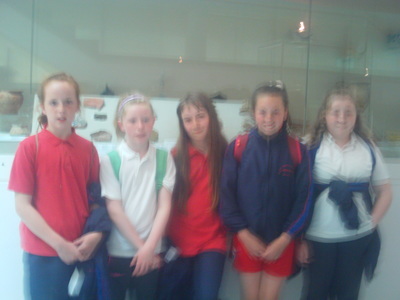 Here is a "Bullán Stone" which contains water. 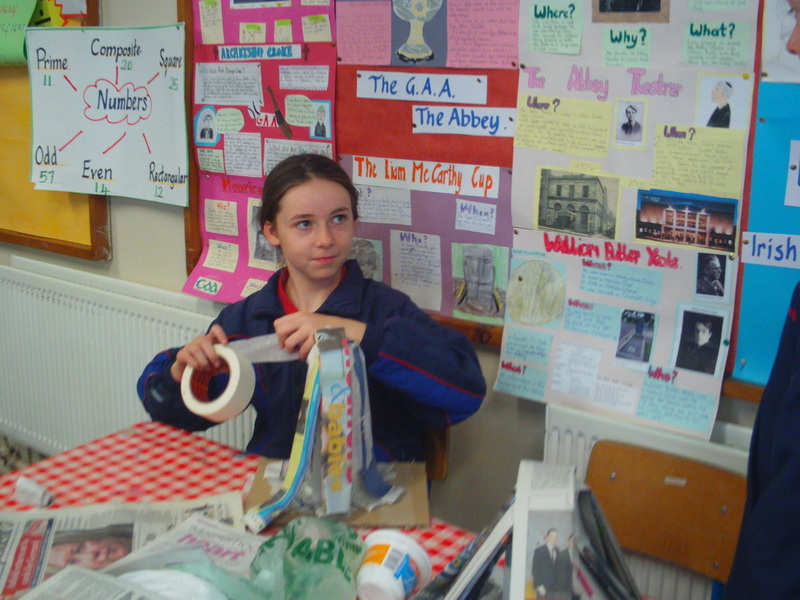 Local people say that this water will cure warts.. All you have to do is place your wart into the water and say a prayer to St Ciarán. The wart should disappear after a few weeks. 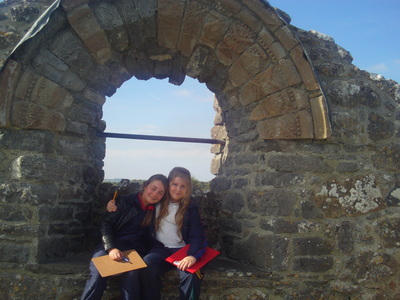 Long ago this "Bullan Stone" was used by the monks to grind wheat to make flour. 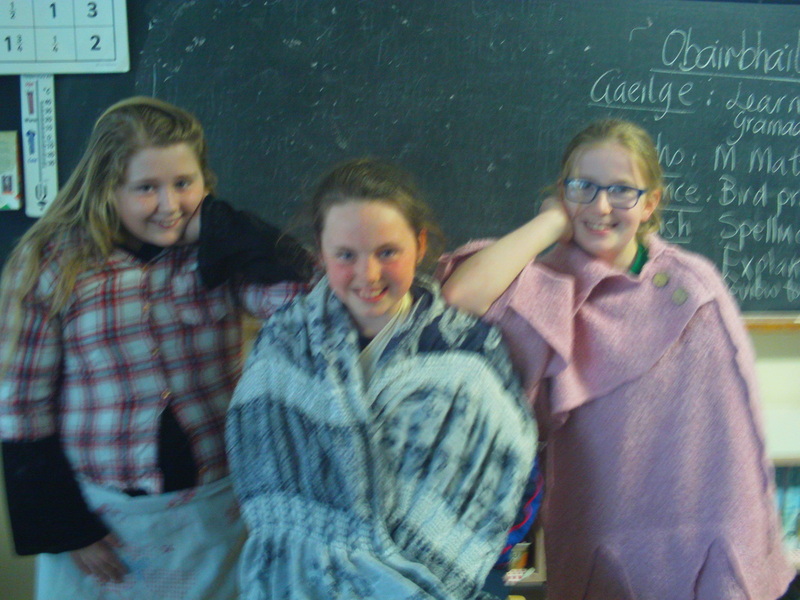 Some farmers take some clay from St Ciarán's Church to place in their fields. 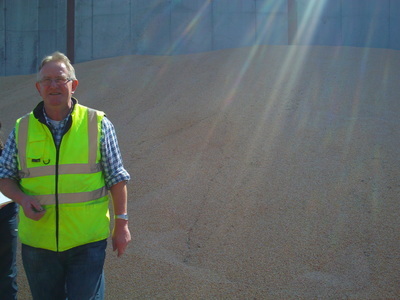 It is believed that this holy clay will protect crops from diseases and danger. Draw a picture OR Discuss the problem. German Pen pals visit Rath N.S. We write letters to pen pals in Germany. The pupils range from tens years to thirteen years. 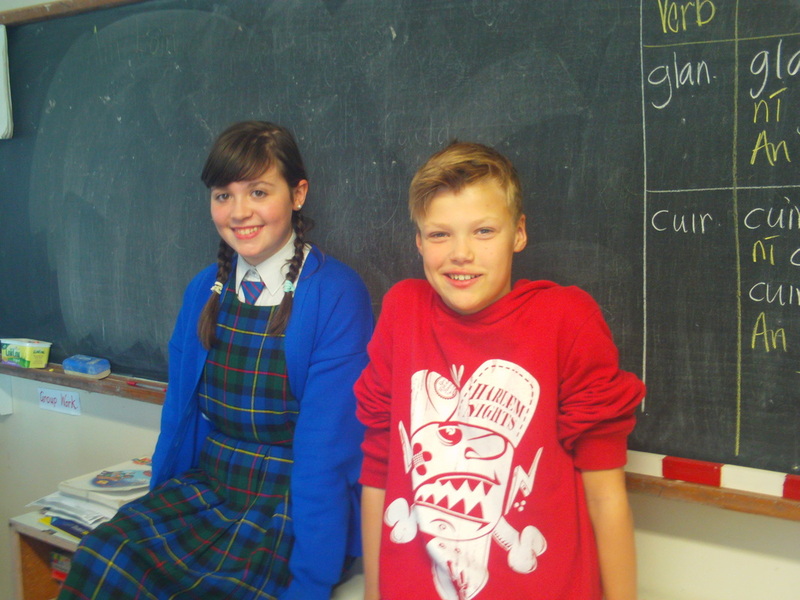 They attend a large school in Hamburg. 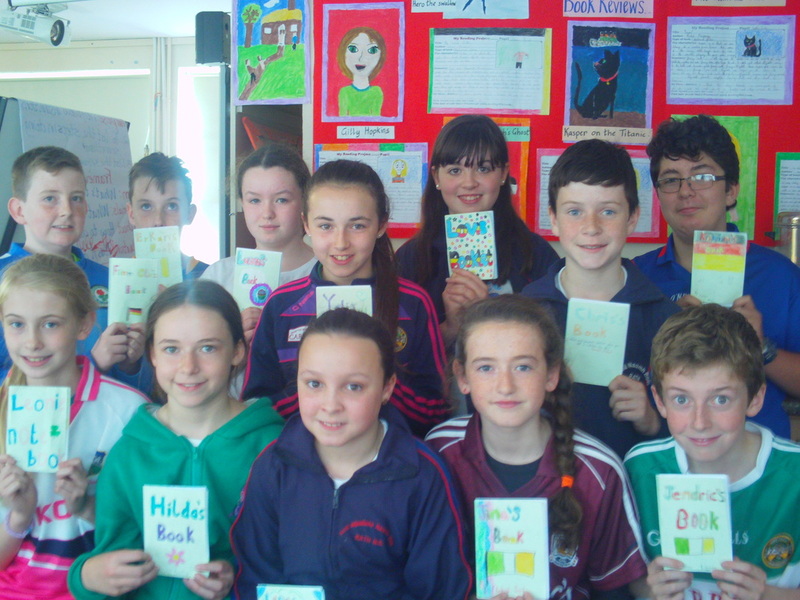 Every month we send & receive letters. 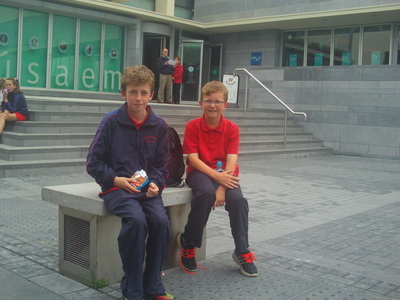 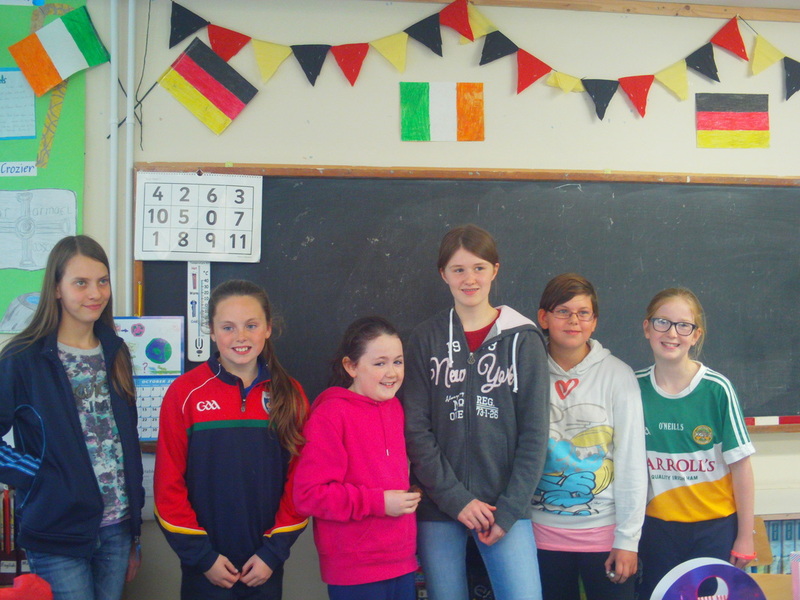 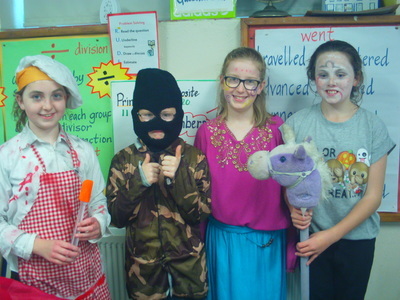 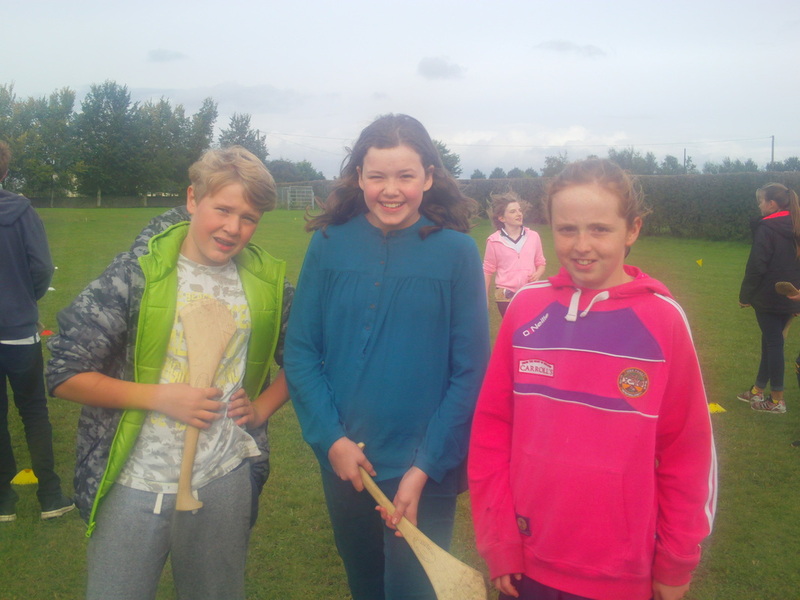 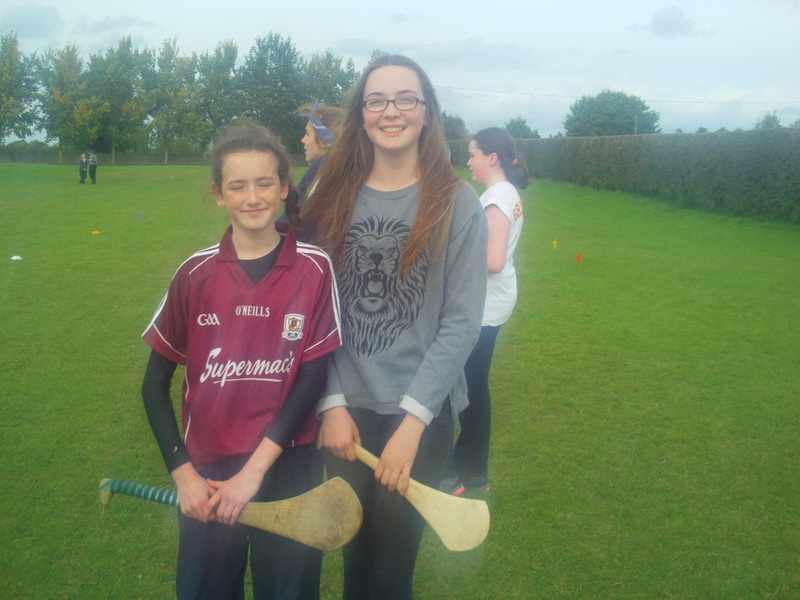 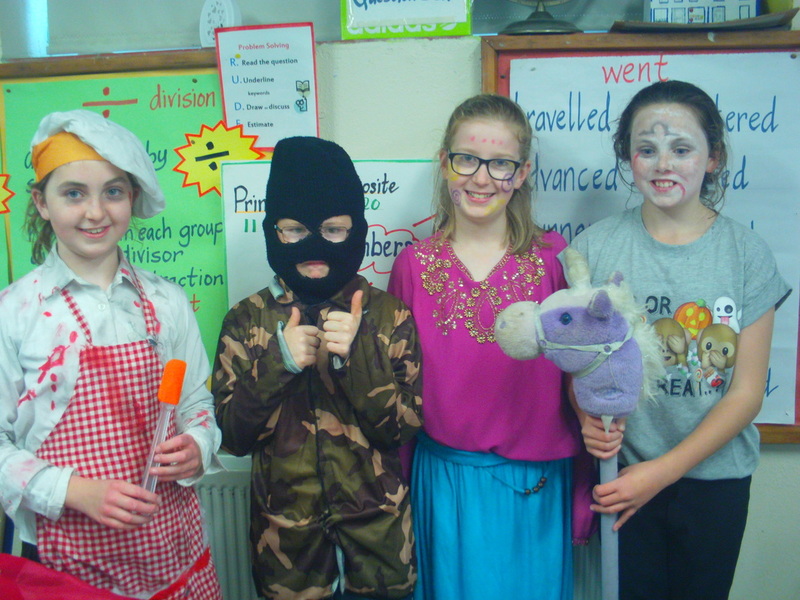 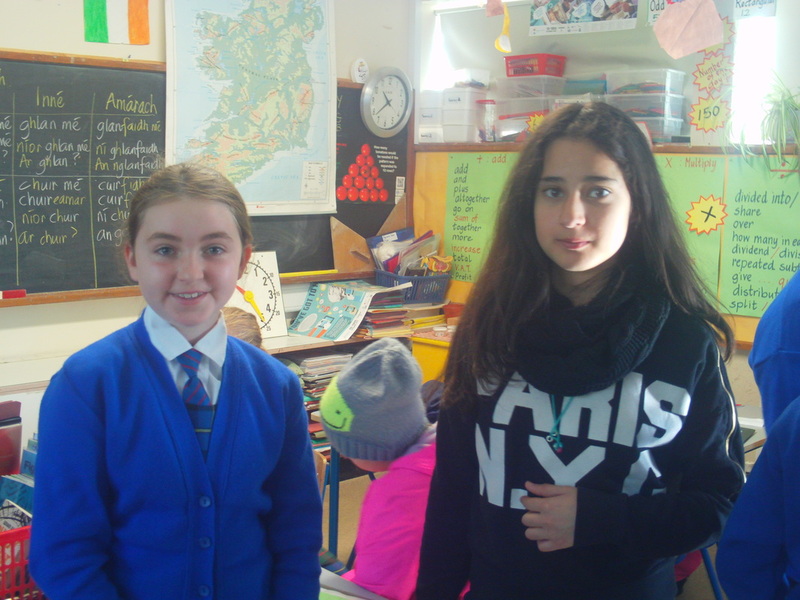 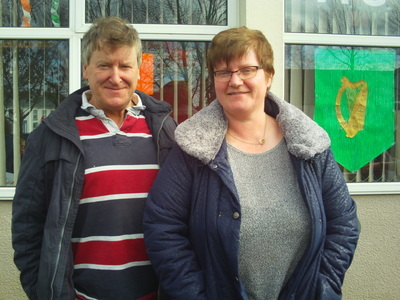 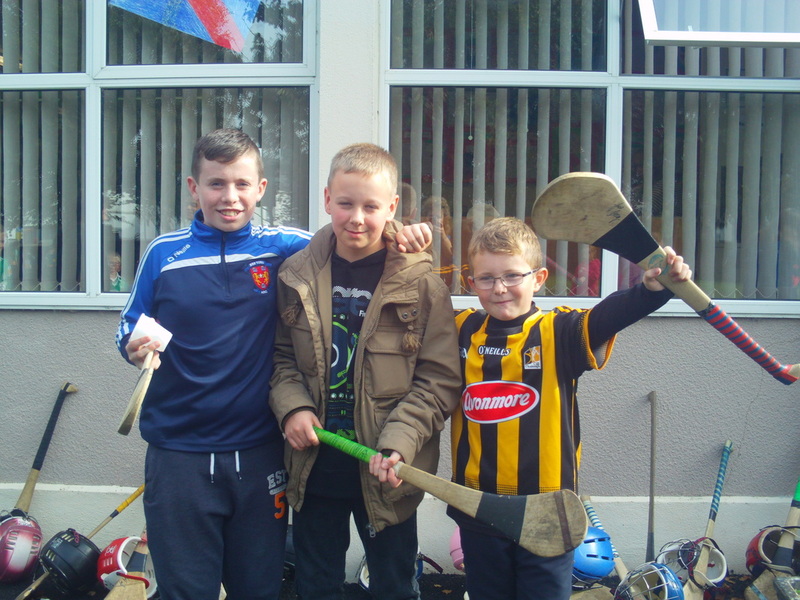 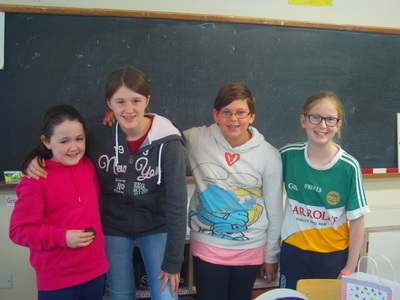 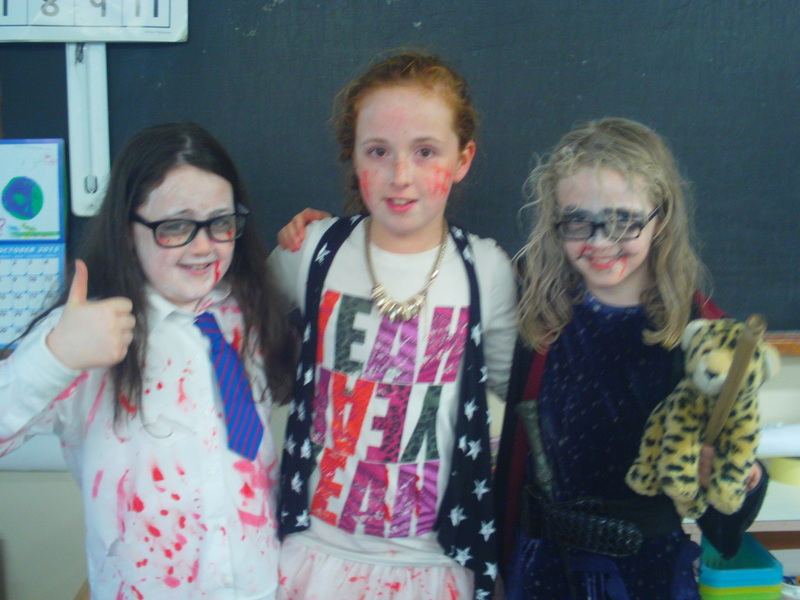 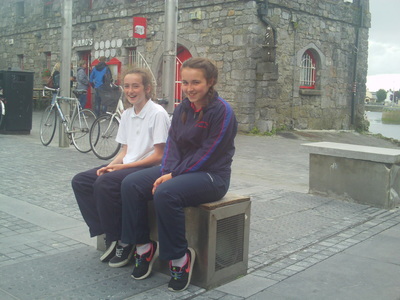 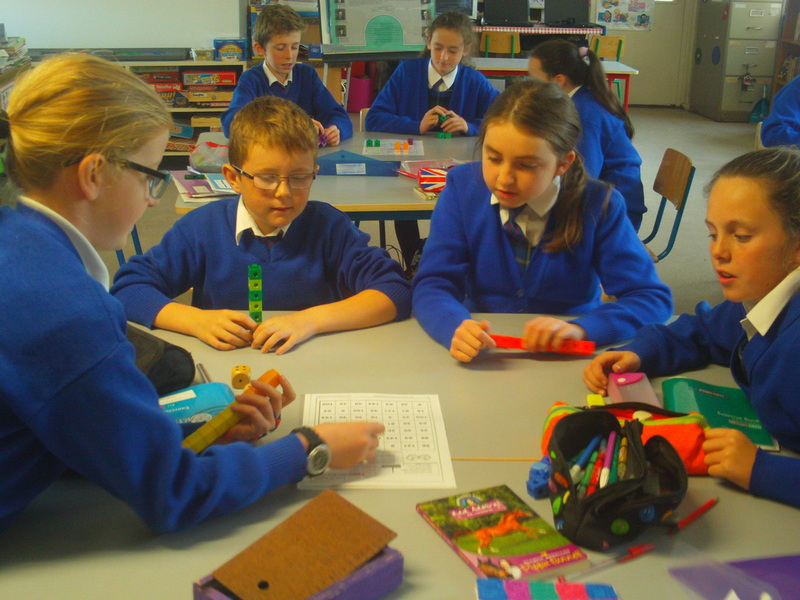 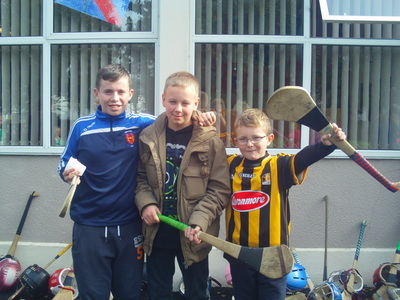 We tell them all the news about hurling, camoige and school activities. 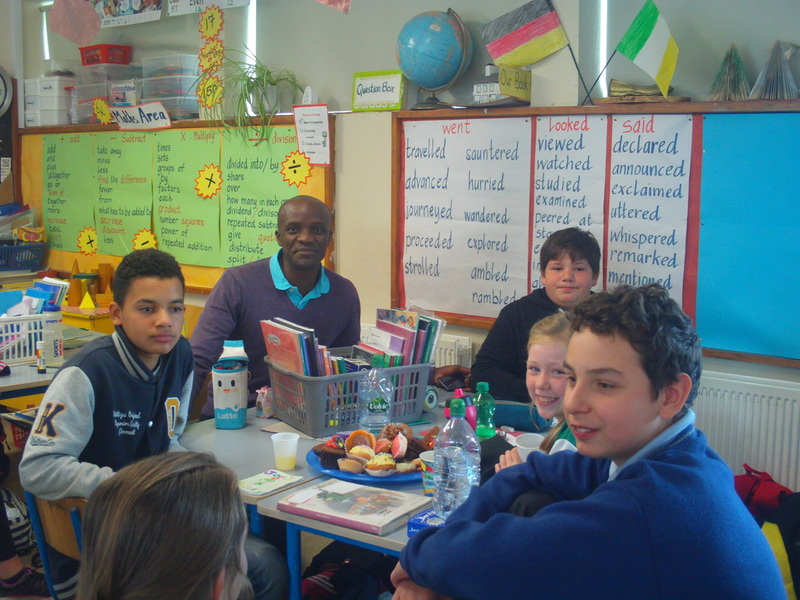 This year our penpals came to visit us. 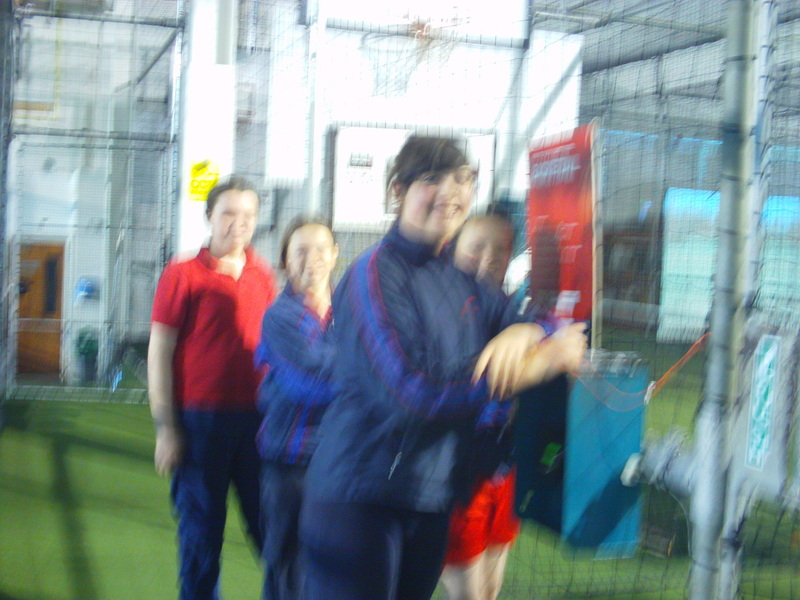 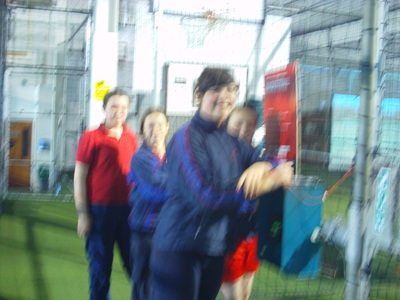 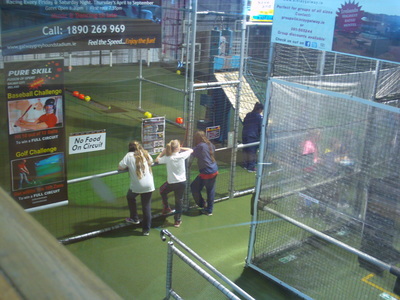 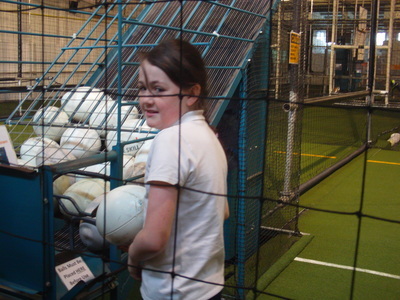 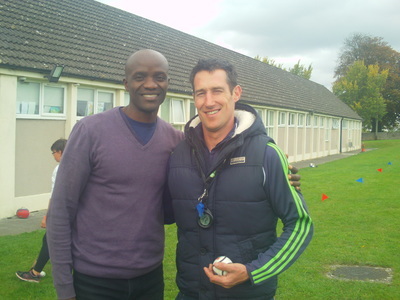 We played soccer and hurling. 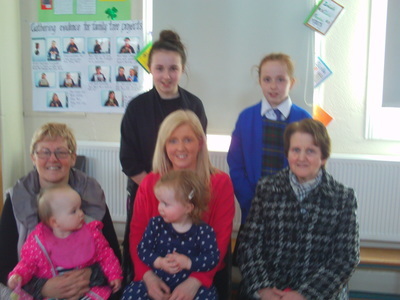 We sang songs for our visitors and we presented each pupil with a book specially written by us. 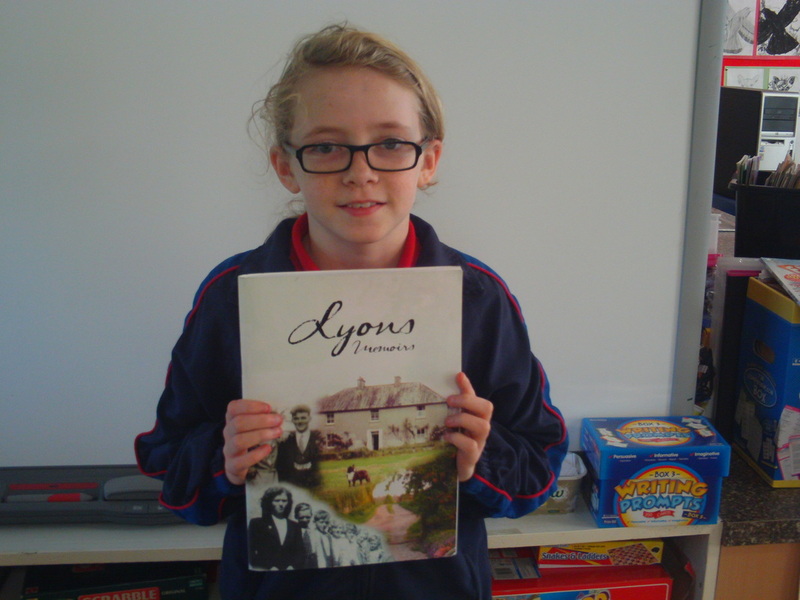 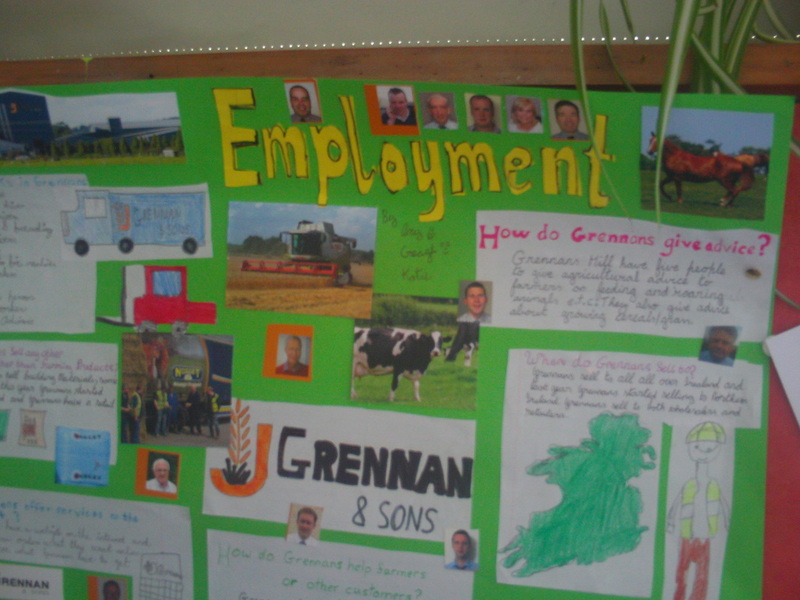 In the book we gave lots of interesting facts about Ireland and even some jokes. 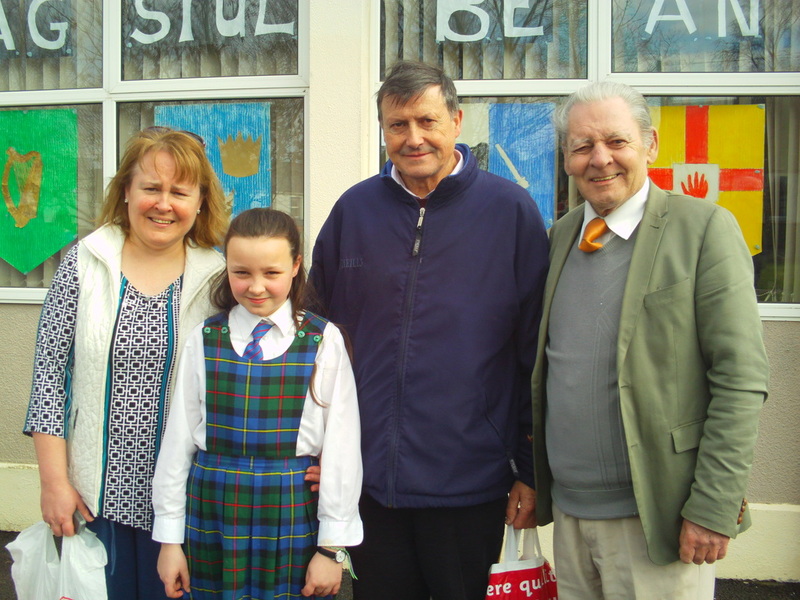 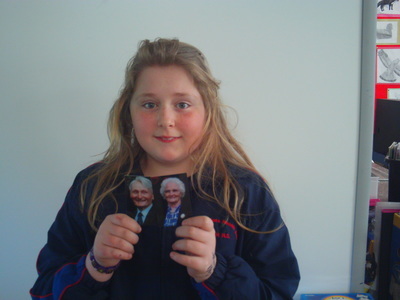 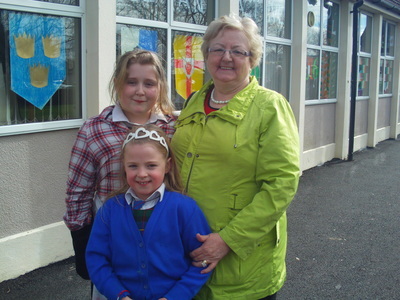 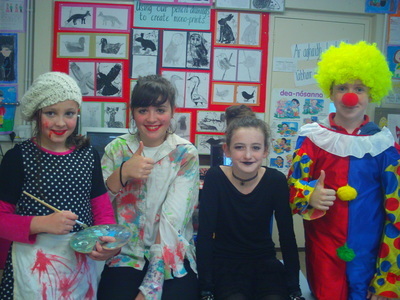 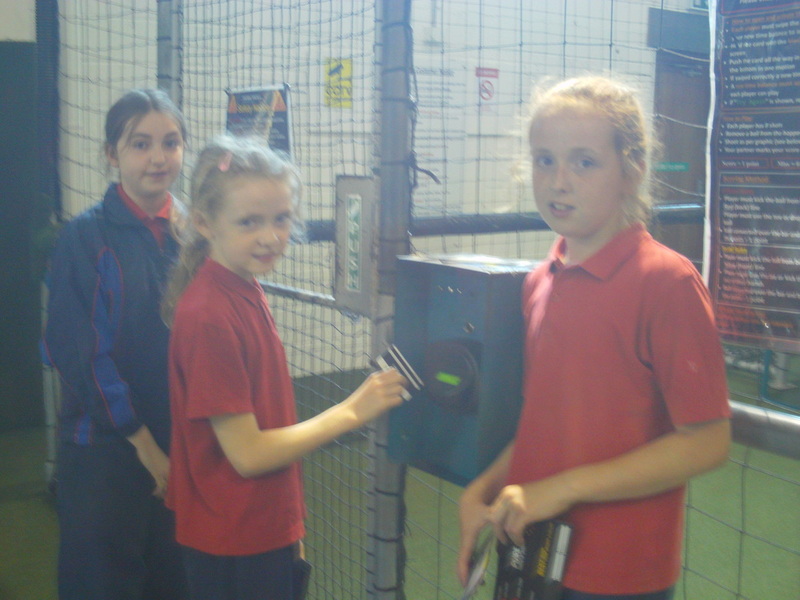 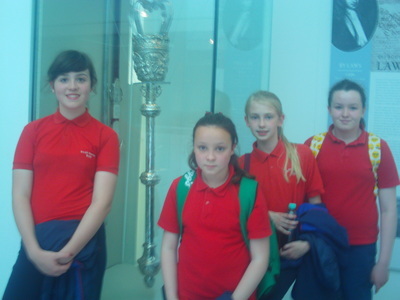 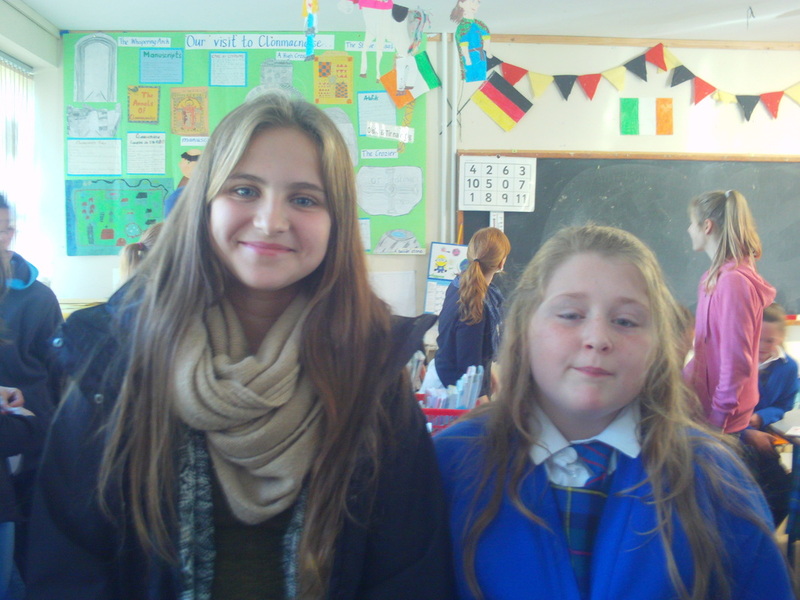 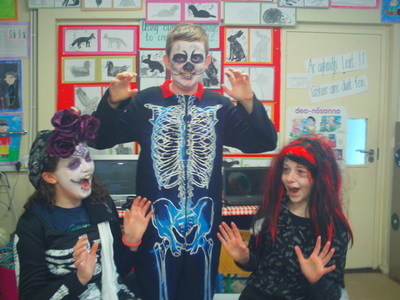 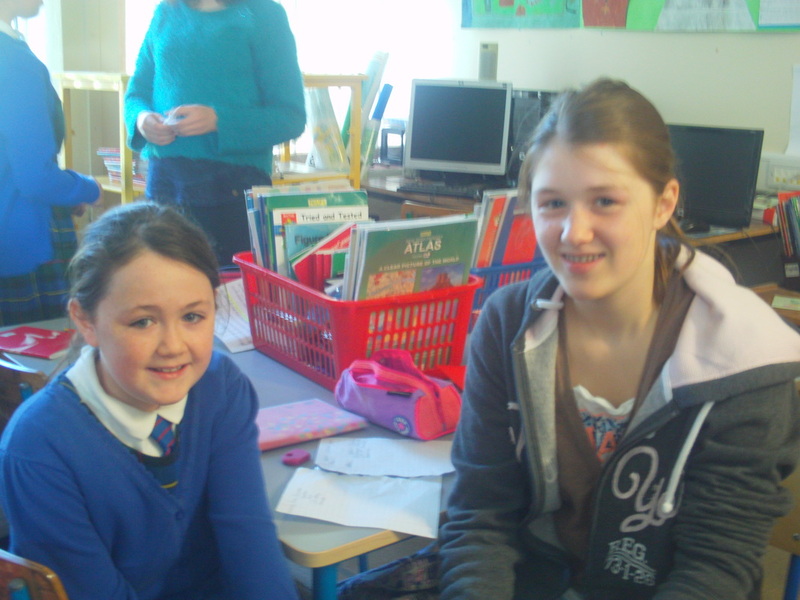 Some of our past pupils came back to meet their former pen pals too. 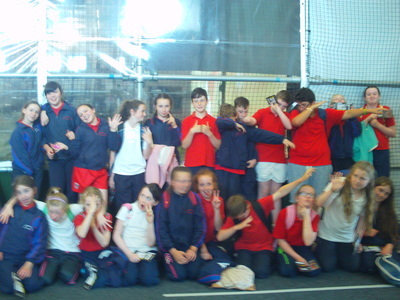 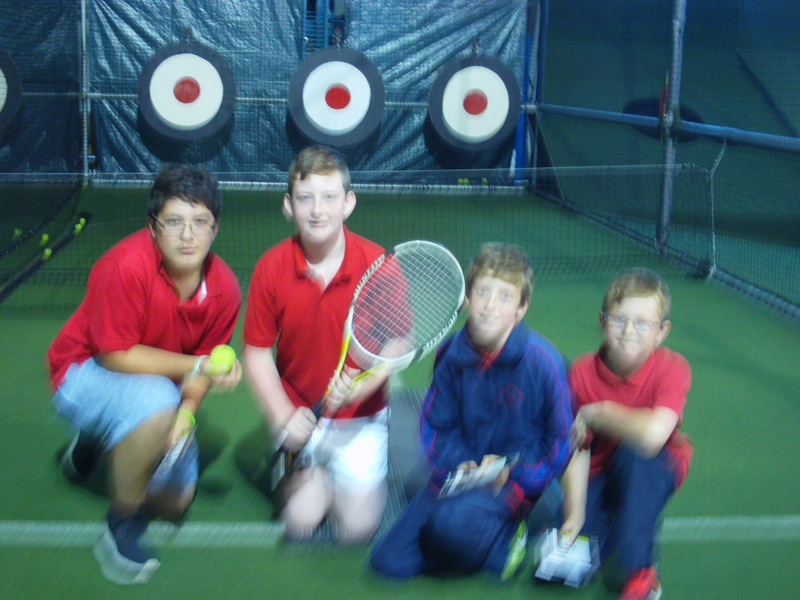 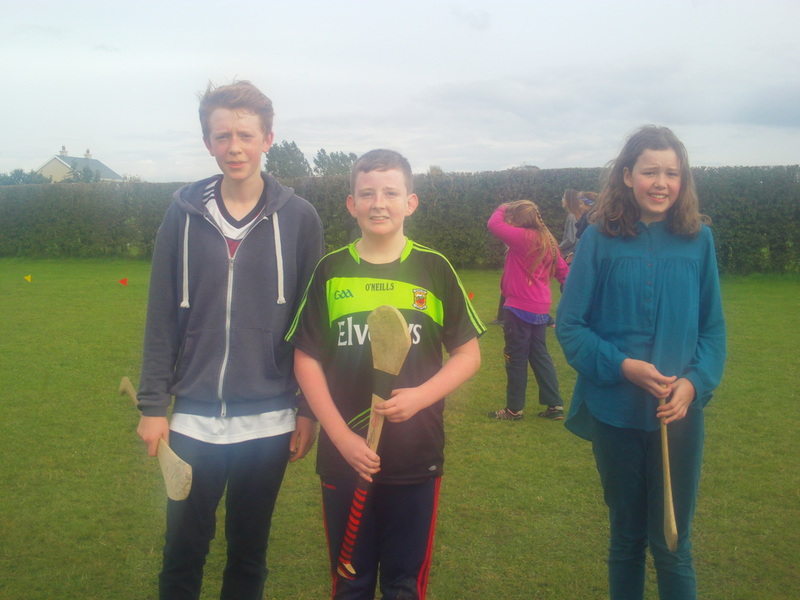 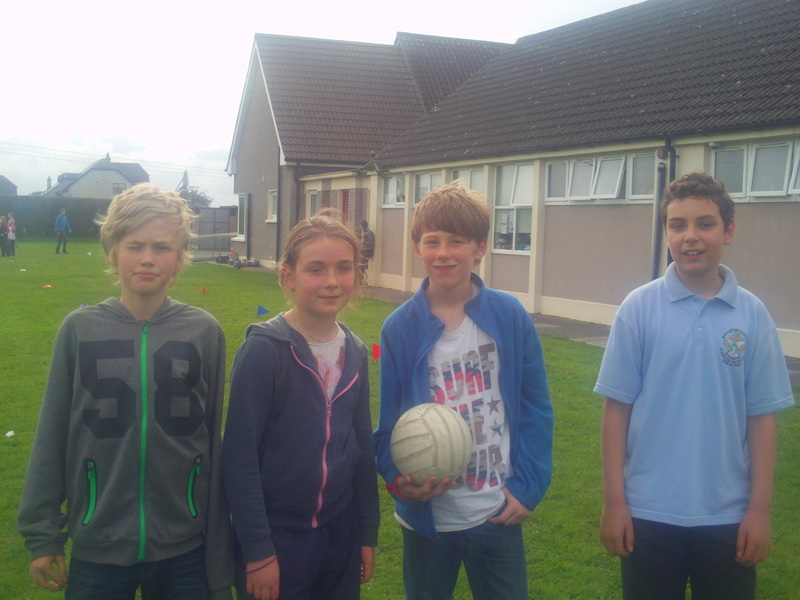 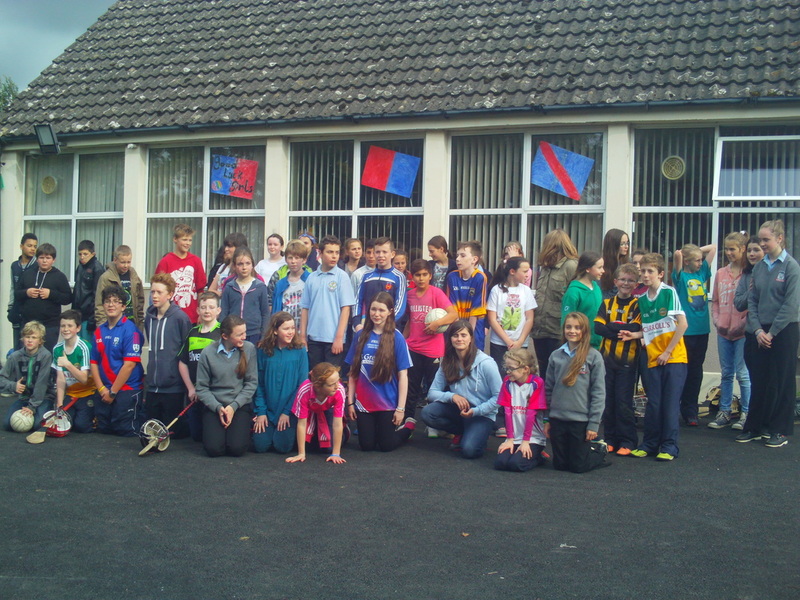 The German pupils loved our school & learning Gaelic Sports. 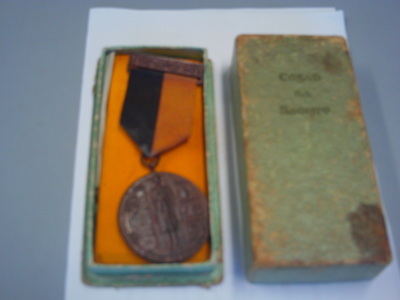 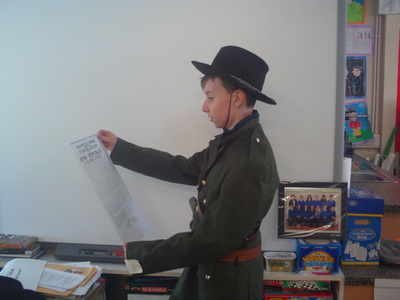 Oíche Shamhna a bhí ann. 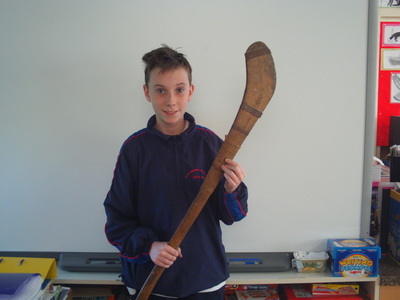 Bhí an sport againn. 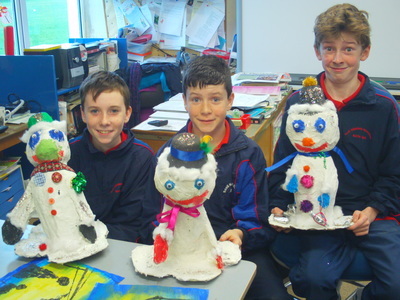 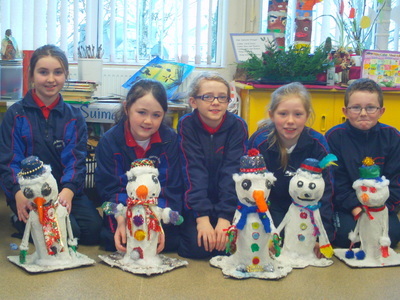 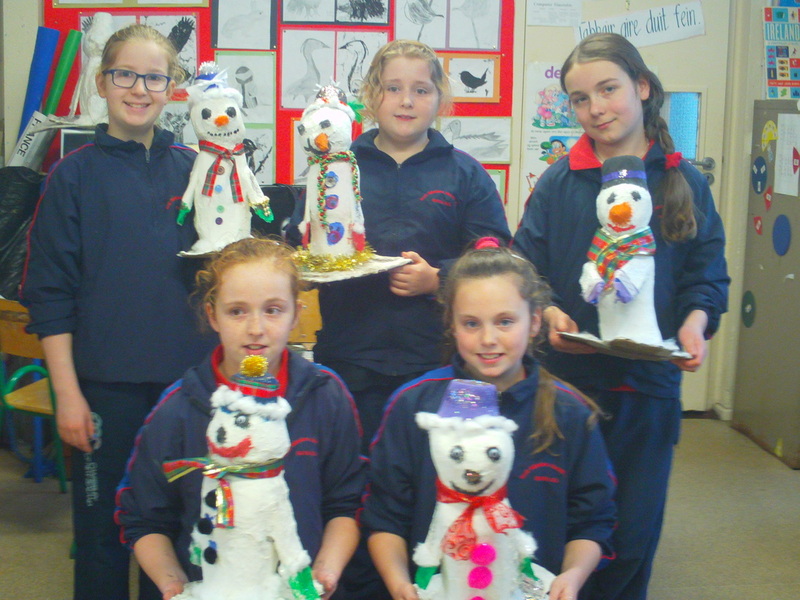 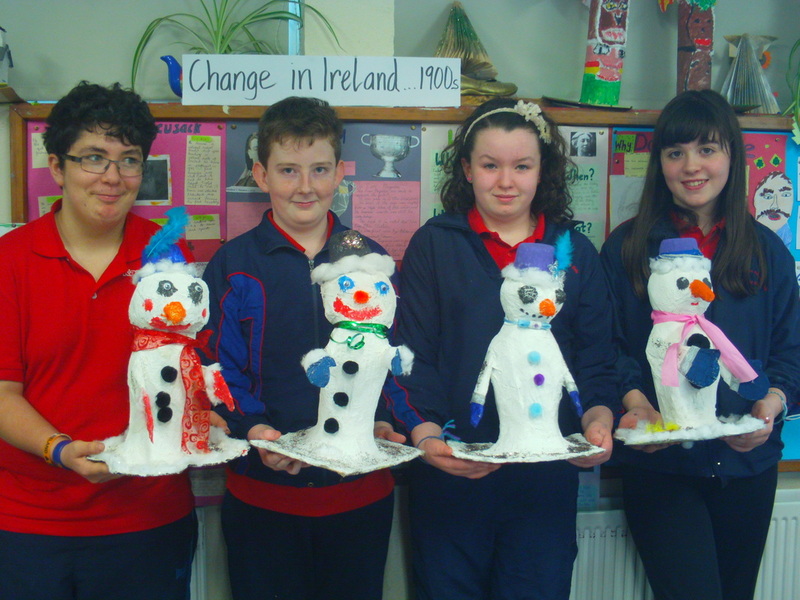 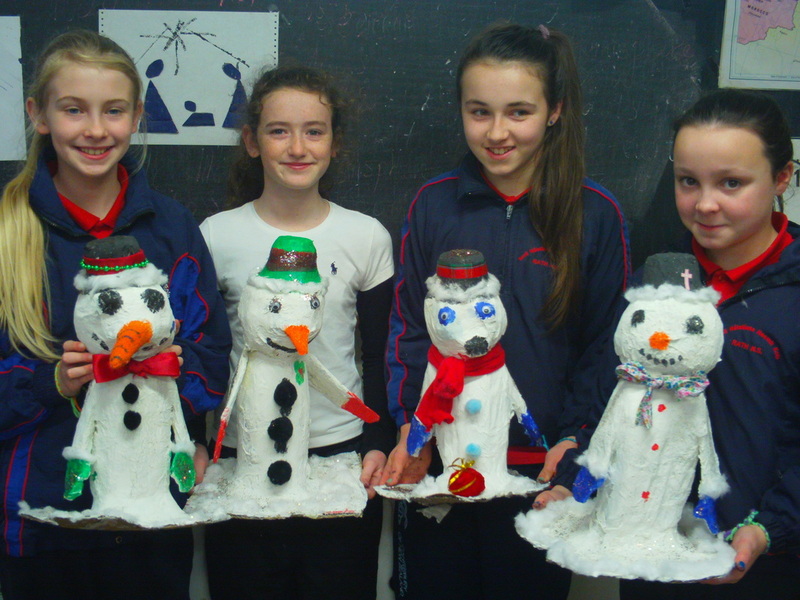 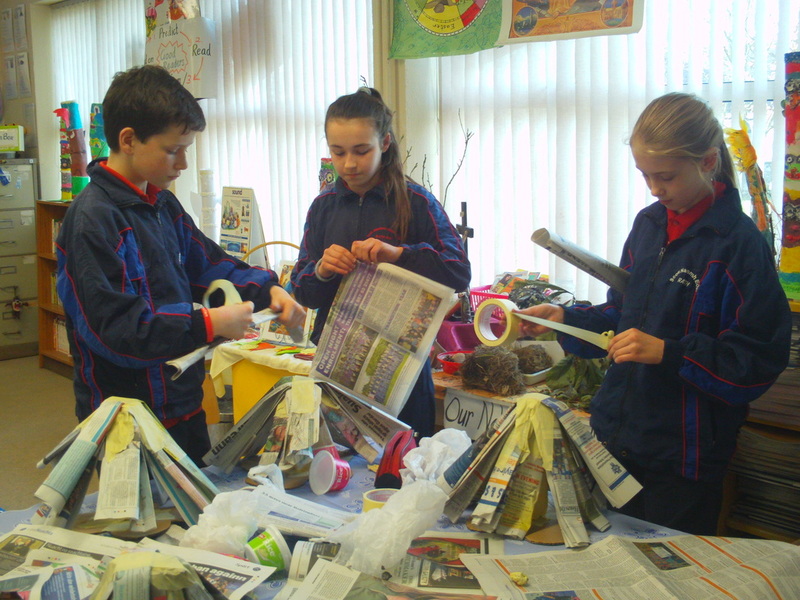 We created Christmas presents, Snowmen, using lots of waste materials such as plastic bottles, yoghurt cartons & newspapers... We covered these with paper mache & painted them and then decorated with Christmas ribbons & other materials. 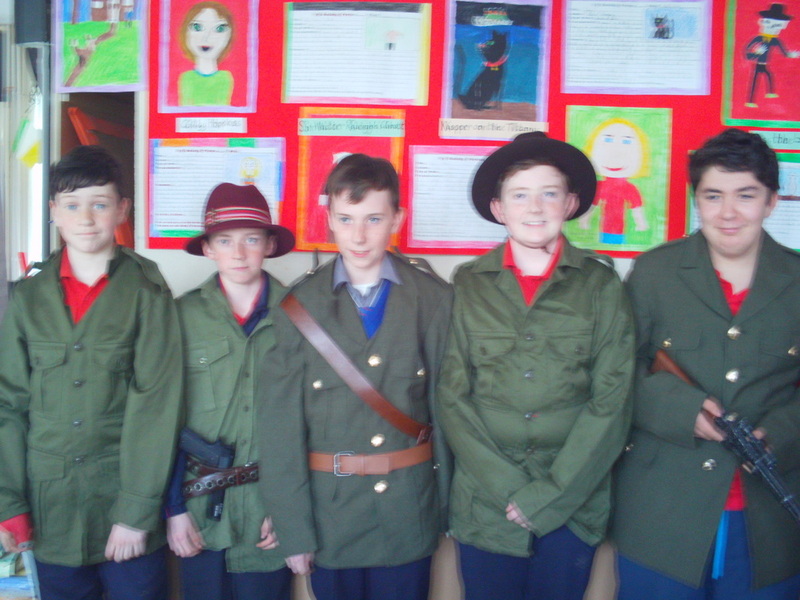 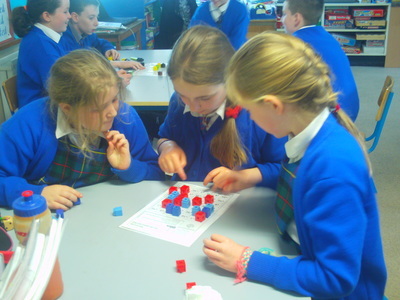 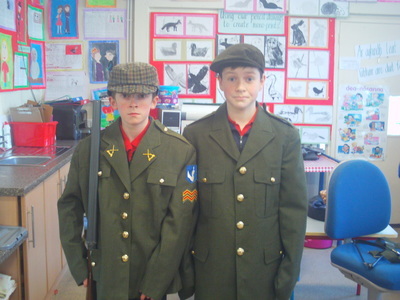 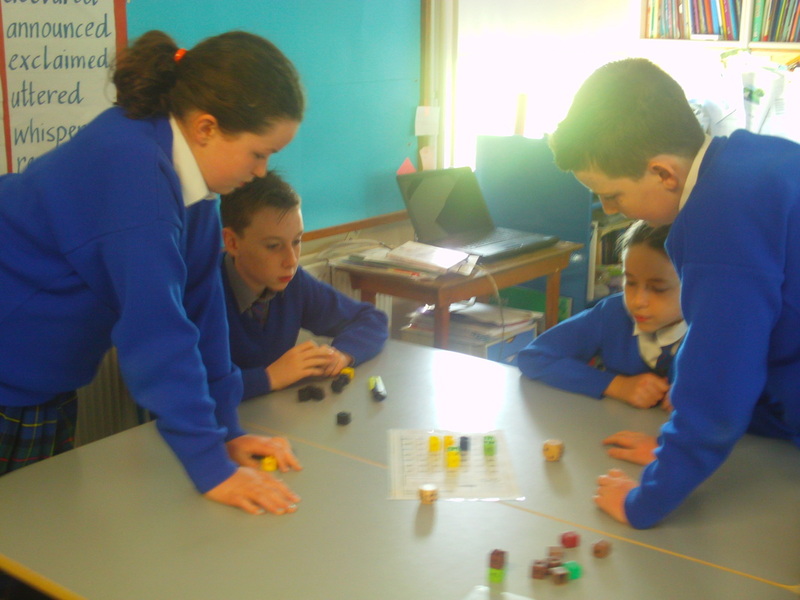 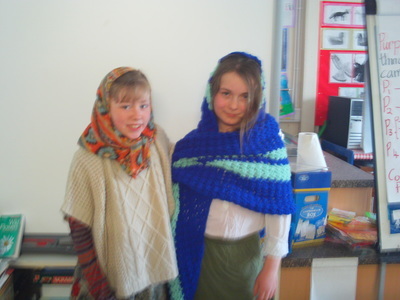 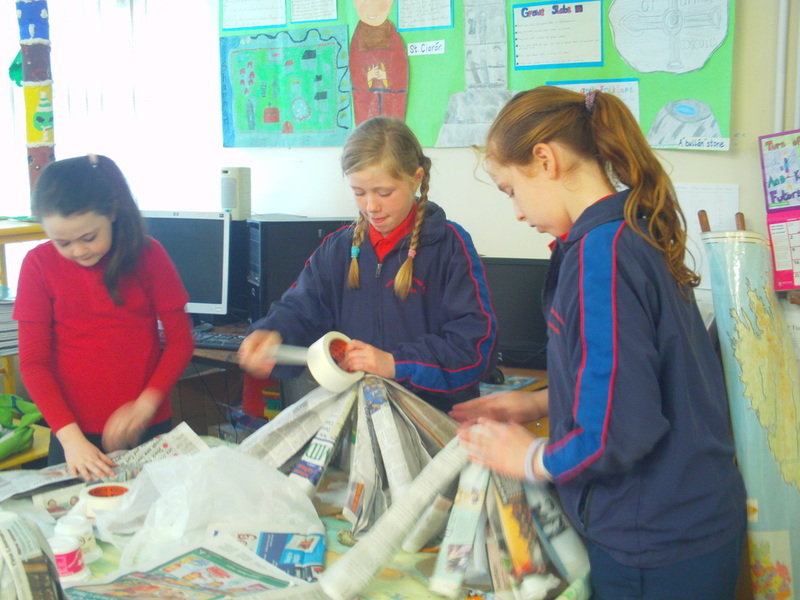 Look what we made .. .. ..
We had great fun researching & discovering facts about the 1916 Rising. We created projects and tried to imagine what life was like for ordinary citizens at that time. 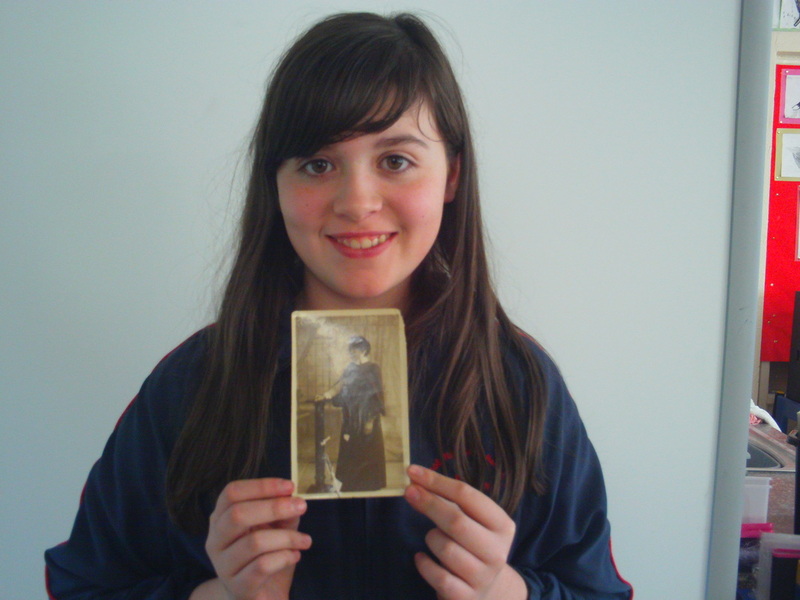 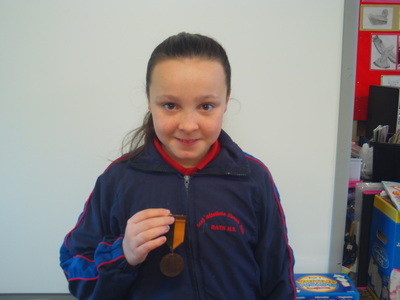 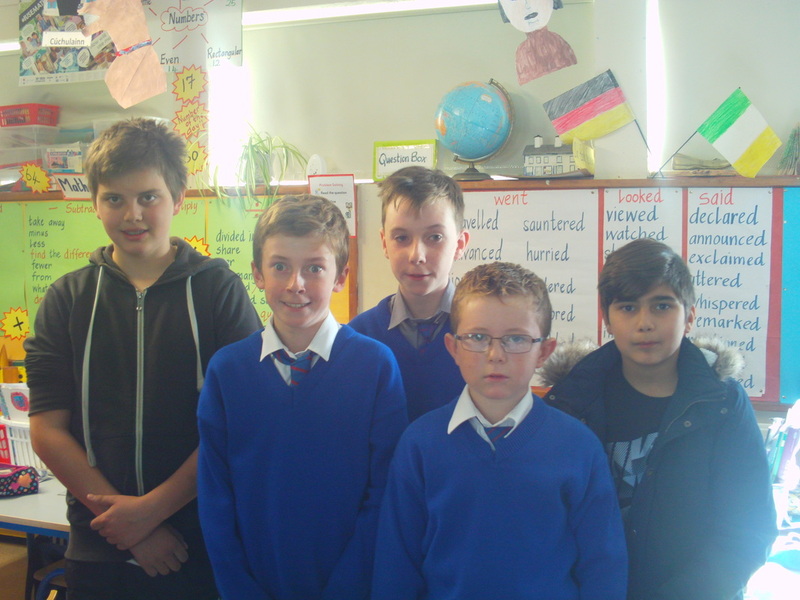 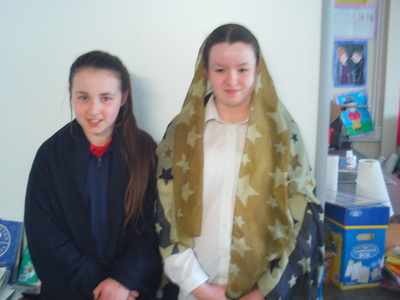 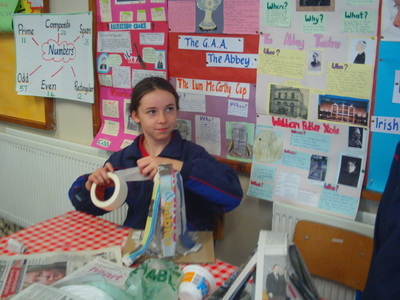 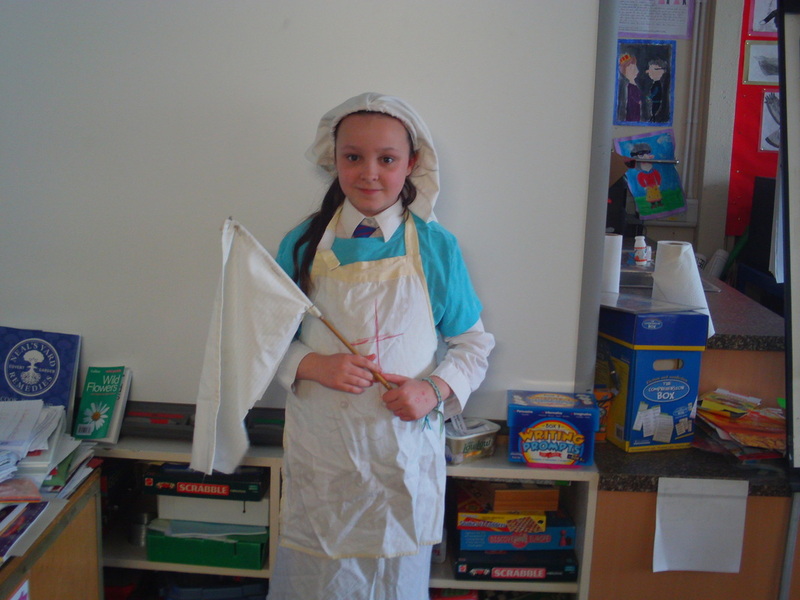 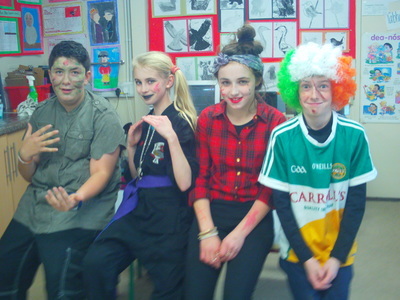 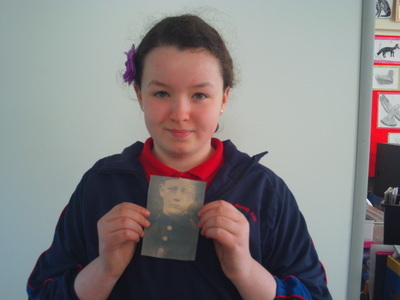 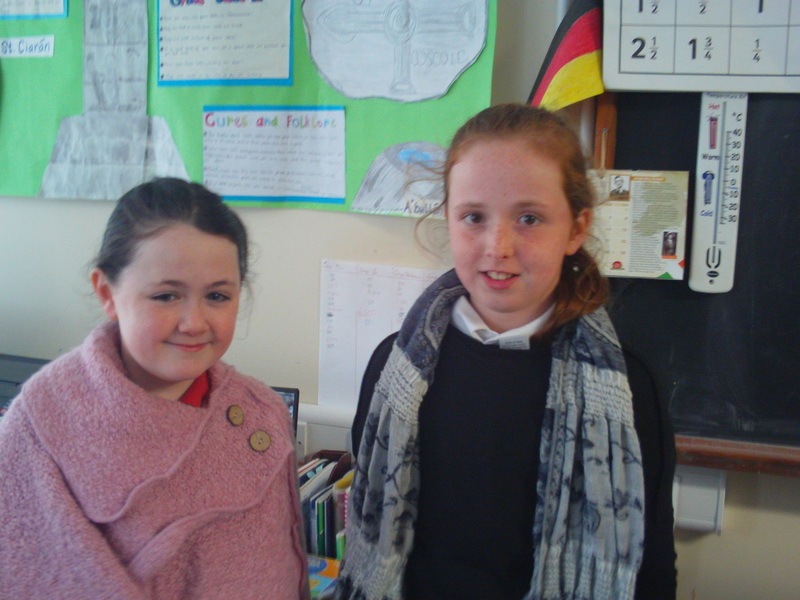 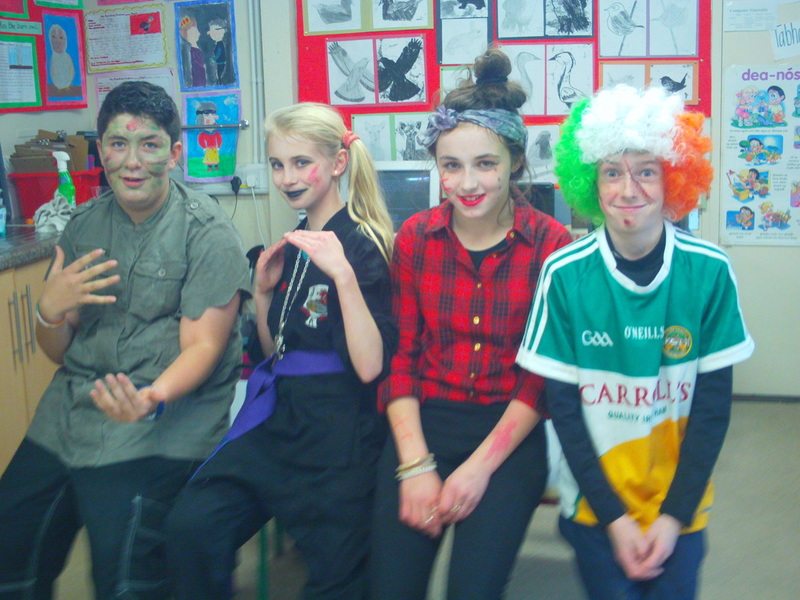 We wrote stories about life in the Dublin tenements and from these we produced a play about the Rising in Dublin. 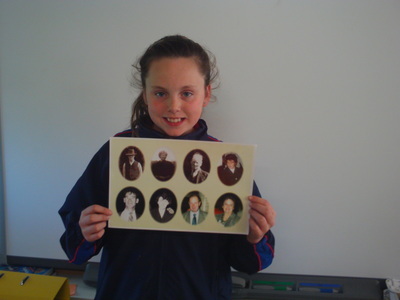 Look at the photographs of some of the characters.. The Rebels in the G.P.O. 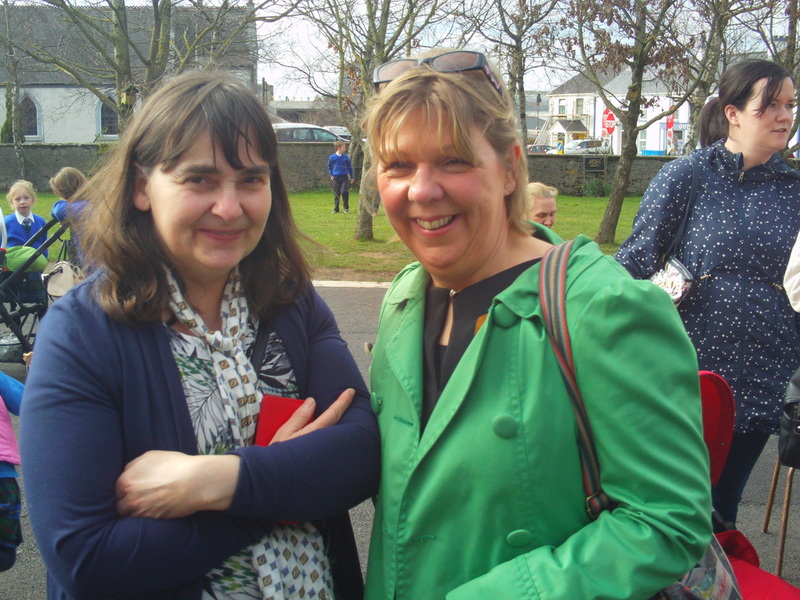 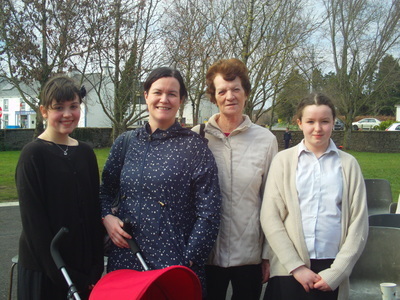 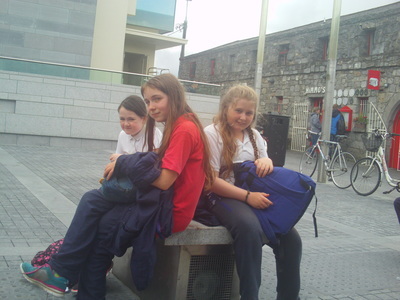 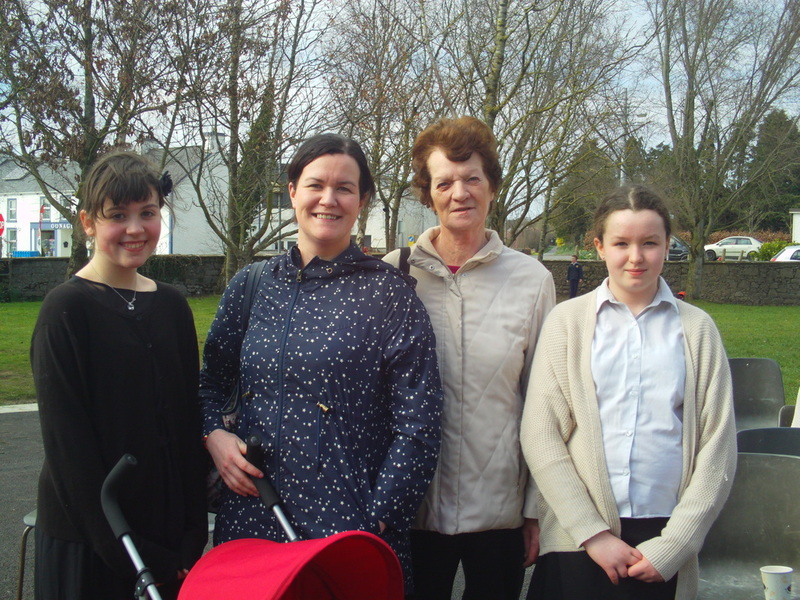 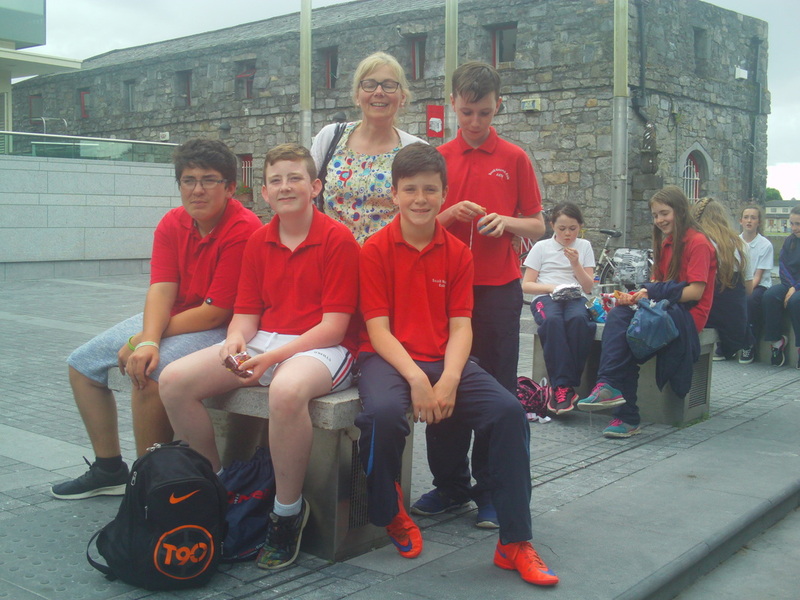 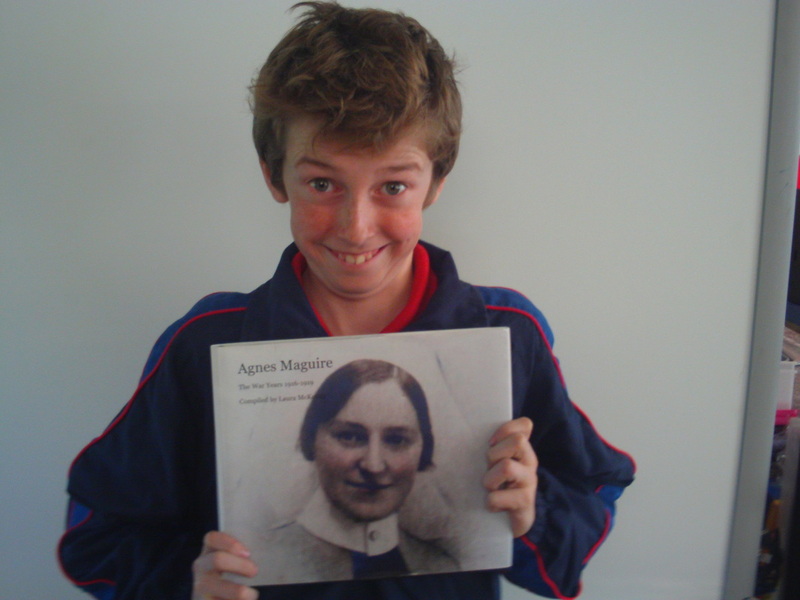 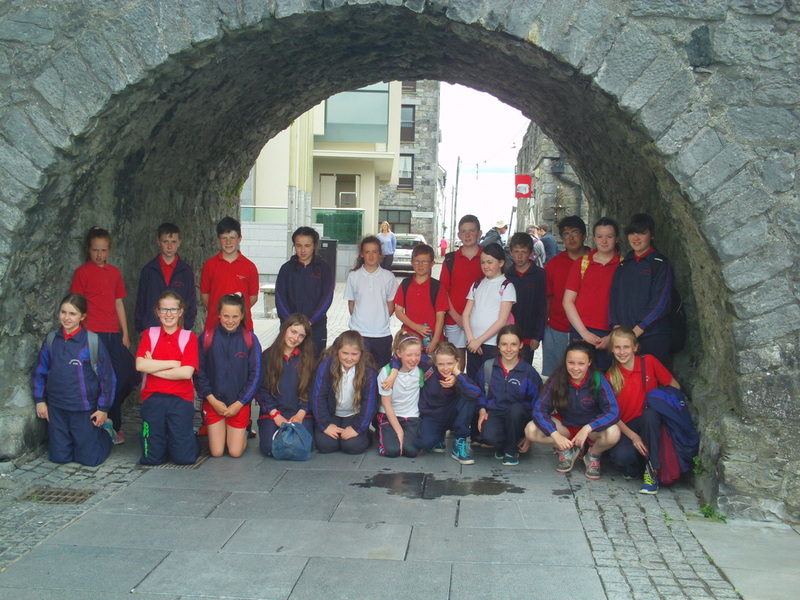 Mrs Pearse, mother of Willie & Padraig..
We decided to look at Grennan's Mill as a local studies project. 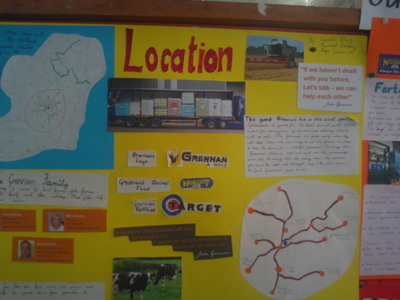 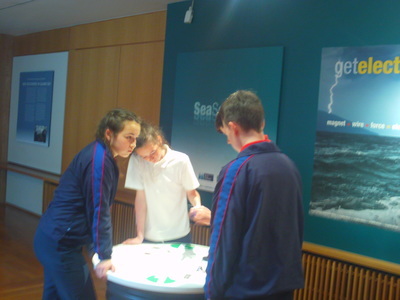 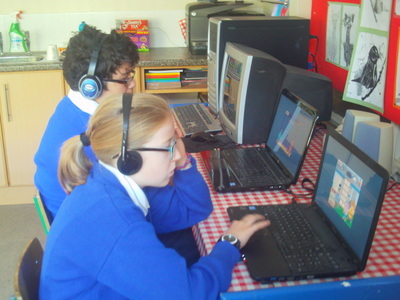 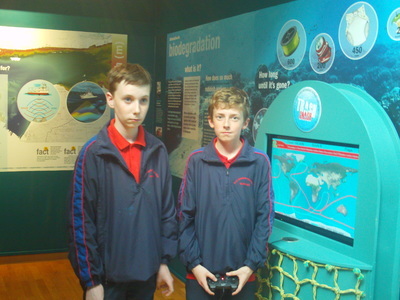 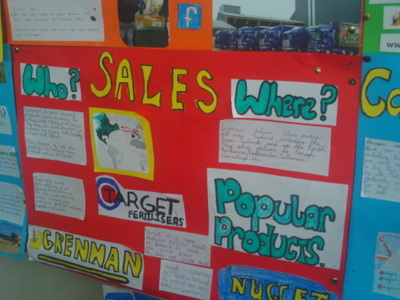 Each group got a topic to research such as Production, Employment, Advertising, Transport, Sales & Care for the Environment. We discussed the aims of our project and each team decided on five questions to research during the visit. 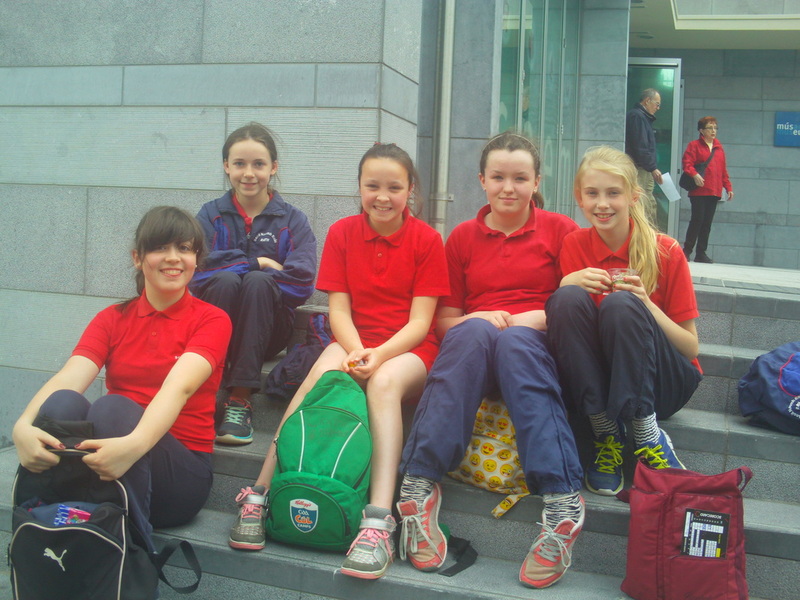 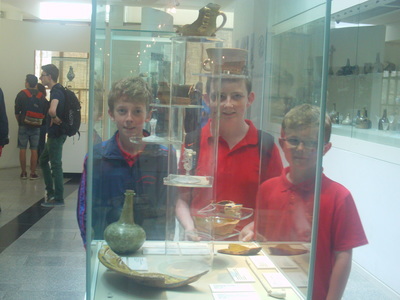 We met with the manager Mr Guinan . 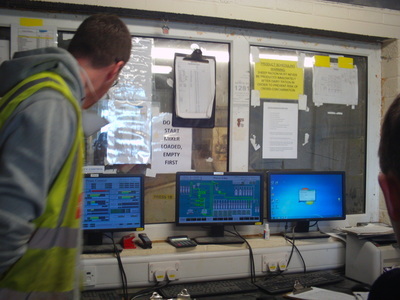 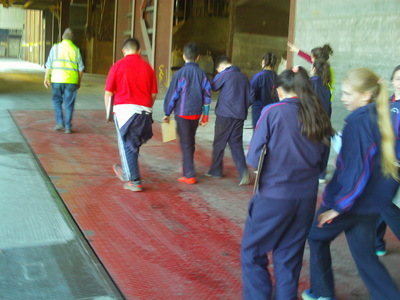 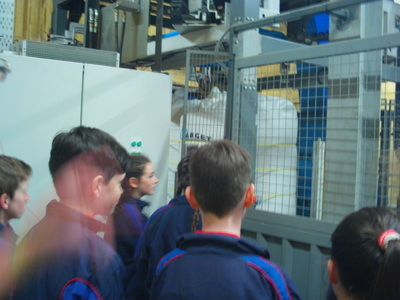 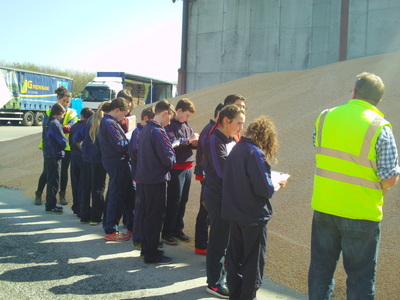 All the groups were given a tour of the mill from the production section to the sales department. 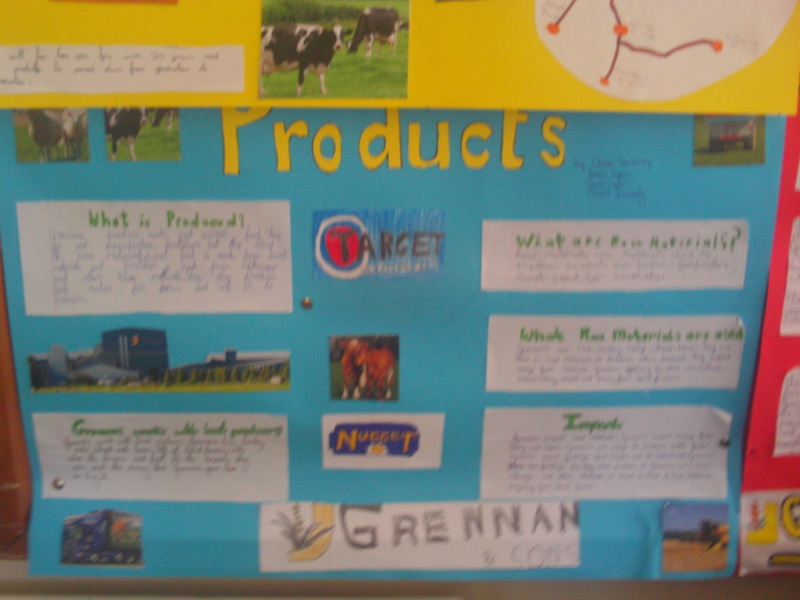 We asked many questions and found out lots of information about how Grennans produce cattle feedstuffs, the raw materials used, the actual production process, machines & technology used and finally advertising, packaging transportation & sales of finished products. 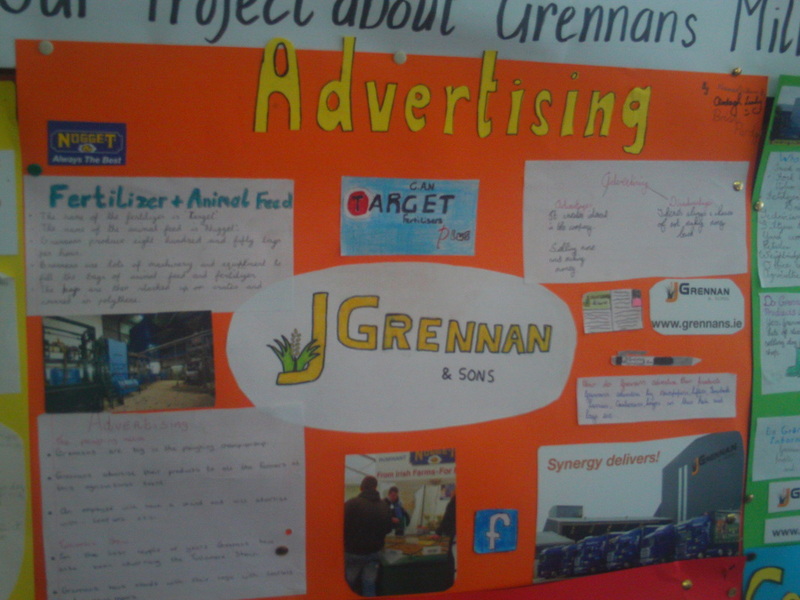 We enjoyed doing this project and we learned a lot about the local business and how much it contributes to our community, by giving employment, providing necessary products for farmers, buying its raw materials eg wheat, barley & oats from local farmers etc. Our parish is very lucky to have such an industry. 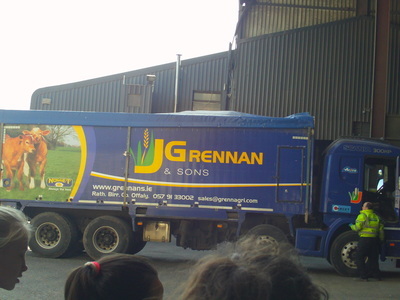 Thank you to Grennans, Mr. Guinan & Mr Gounde for taking the time to show us around the factory, for answering our questions and for the great experience we all had.